It's always challenging to try to photograph ice cream in 80 degree weather! Almost as challenging as eating ice cream in 80 degree weather. You have to do both very quickly! But this recipe sounded so delicious that I just had to give it a try. It's from the June 2006 issue of Gourmet Magazine and it's my June submission to Gourmet Unbound. With summer fast approaching, ice cream is one of those cool refreshing treats that everyone loves and these praline ice cream sandwiches are the best! Every reviewer loved this recipe. It's kind of a grown up version of the kid's treat. The praline adds not only a perfect crunch but a wonderful rich buttery flavor. Using a good quality vanilla ice cream allows the sandwich to take center stage and not be overpowered by the ice cream flavor. I did halve the recipe because it would be dangerous to have too many of these in the house..I'm sure you know what I mean! It is not at all difficult to make but there are several steps you need to do. I would suggest, once you've assembled the sandwiches with the ice cream, to wrap and freeze them but once frozen, I would cut them into individual sandwiches and rewrap. This way, you can just reach into the freezer and grab one without having to cut them apart each time. Just a suggestion! 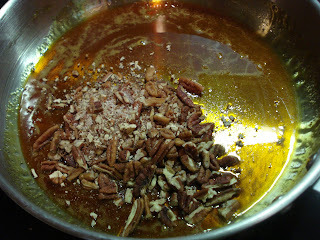 The first step is to make the praline. 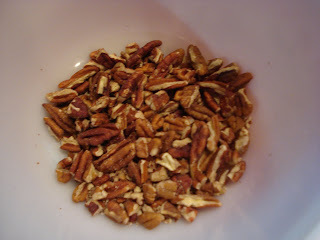 Place the pecans into a small bowl with the salt and stir. Place a sheet of foil onto your work surface. Cook the sugar in a skillet, undisturbed, til it begins to melt. 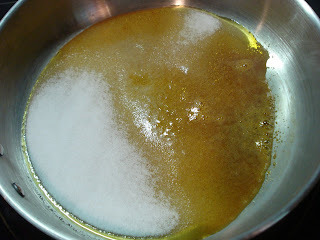 Continue to cook on moderate heat, stirring occasionally, til sugar melts and the mixture takes on a nice caramel color. 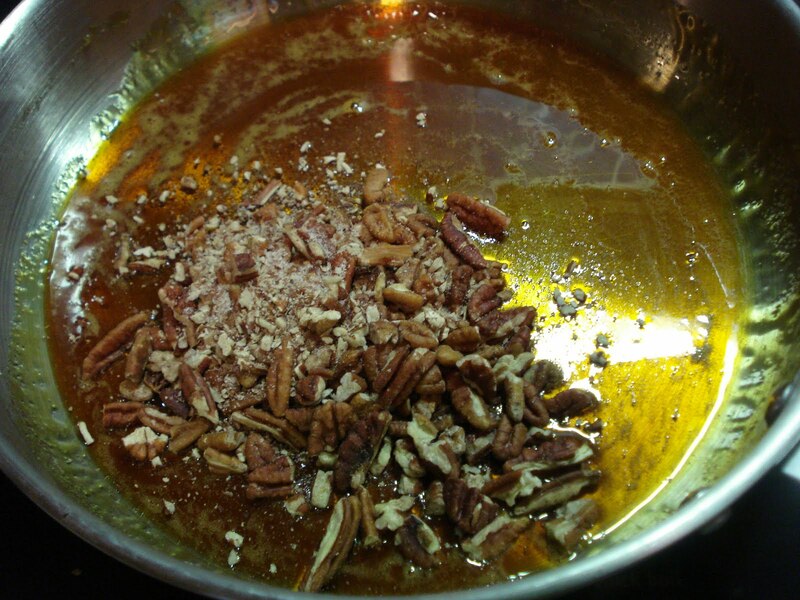 Dump in your pecan/salt mixture and stir to coat pecans. To make the sandwich layer, whisk the dry ingredients and set aside. 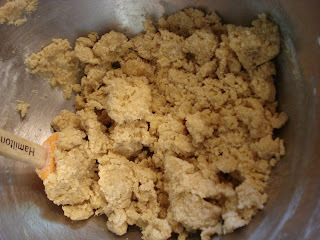 Place the brown sugar and butter in a medium bowl and using an electric beater, beat 3 minutes, or til pale and fluffy. Add the eggs beating well after each addition. Beat in the vanilla. Add in the dry ingredients in 2 batches. 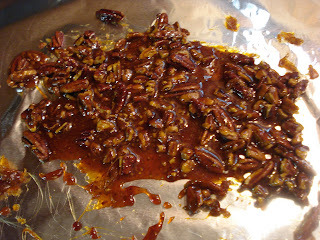 Sprinkle the chopped pralines over top and bake for 10 minutes. Or til it gets a nice golden color. 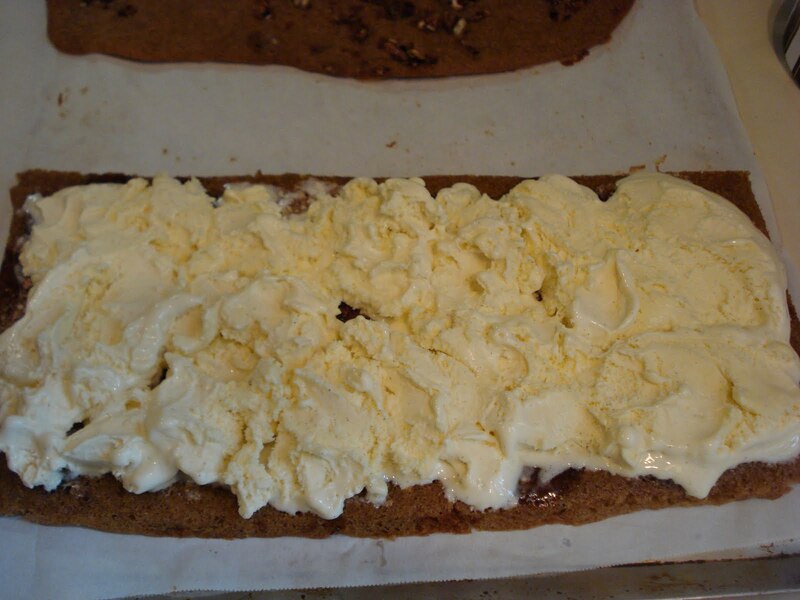 Once you've allowed time to let it cool, spread a layer of softened vanilla ice cream onto half the layer, then top with the other half to make a sandwich. Wrap in plastic and place into freezer an hour. 1 1/2 sticks unsalted butter, room temp. Plus a little more for greasing the pan. 1. Stir pecans and salt in a small bowl. Set aside. 2. Put a sheet of foil on a work surface. 3. Cook sugar in a heavy 10" skillet over moderate heat, undisturbed, til it begins to melt. 4. Continue to cook, stirring occasionally, til sugar melts into a golden caramel. 5. 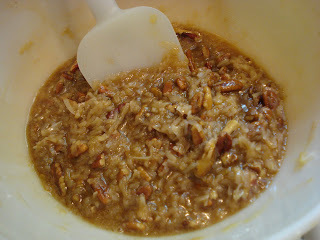 Add salted pecans, stirring til coated well. 6. Spread onto the foil . Let it cool completely, about 15 minutes. 7. Peel praline off foil and chop praline coarsely ( some reviewers suggested the fine chop Gourmet recommended was too fine). Preheat oven to 375. 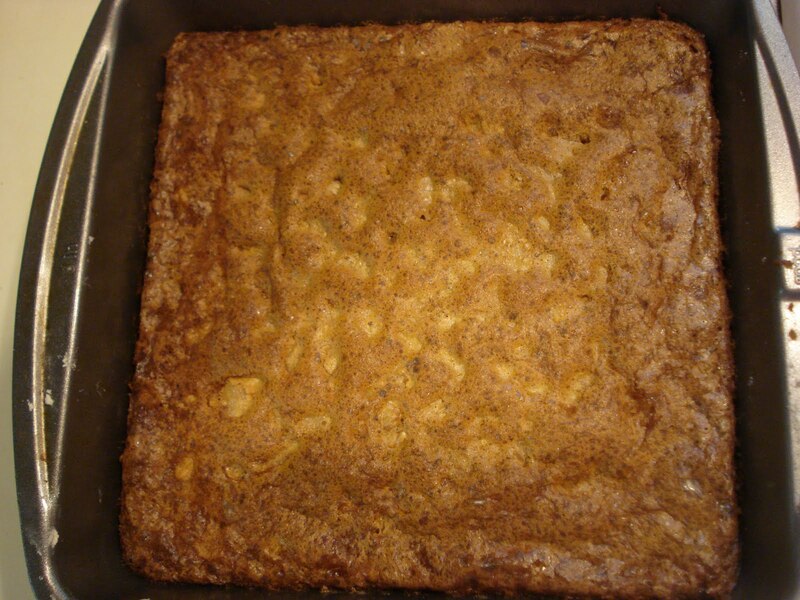 Draw a large X with butter onto 2 baking pans, 15 1/2" x 10 1/2" x 3/4" deep each. 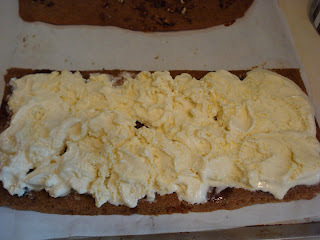 (Basically a jelly roll pan) Press parchment paper onto butter X to hold in place. Leave a 1" overhang on outer side edges. 1. Whisk flour, baking powder, baking soda and salt in a small bowl. Set aside. 2. 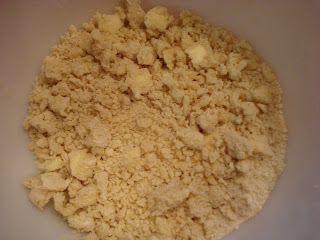 Beat butter and brown sugar in another bowl with electric mixer at medium speed til pale and fluffy, about 3 minutes. 5. Reduce speed to low and add flour mixture in 2 batches. Mix til just incorporated. 6. 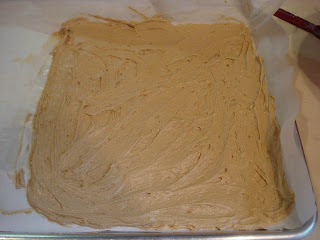 Divide batter between 2 pans, ( if using full recipe), spread a thin layer, using an offset spatula. 7. 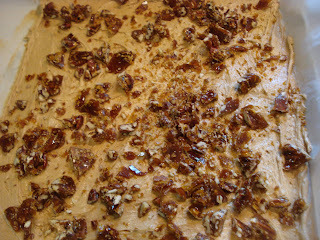 Sprinkle chopped praline over top. 8. Bake, switching pans halfway through the baking, til golden but still tender, about 10 minutes. 9. 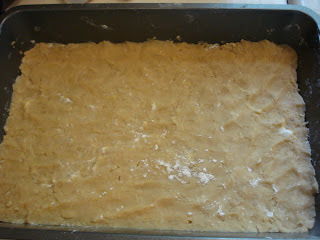 Cool in pans 10 minutes, then transfer with the parchment paper to wire rack to cool completely, about 30 minutes. 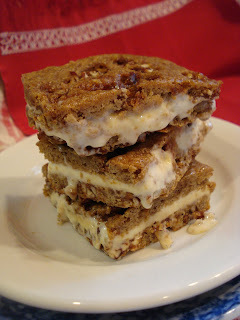 Transfer one layer of the sandwich, praline side down and spread the ice cream over top. Then place the other layer on top of this to make a sandwich. 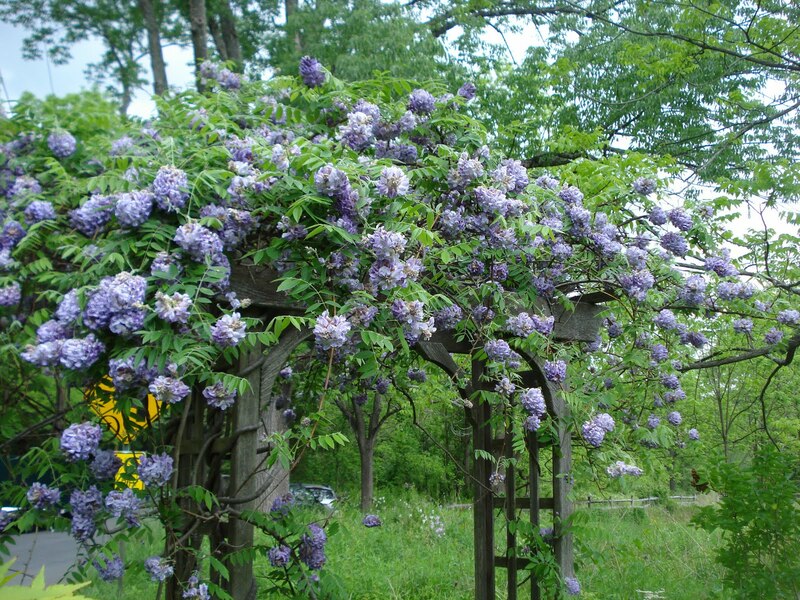 (They suggest you trim the edges, to make it nice and neat, I suppose, but I didn't think this step was necessary. )Gently press and wrap in plastic and freeze for at least one hour. * See my notes above about making individual servings*. Before I begin the story of where I found this pie recipe, I just want to say this is one fabulous pie! I'm usually not one for liking shoofly pie. I live in area of the country that is just close enough to Pennsylvania Dutch country and my local supermarkets have these pies for sale all the time. But I tasted a sample once and that was enough for me to know this was a pie I could certainly live without. But, hey, just because one sample taste was lousy doesn't mean they're all bad..right? So when I saw this recipe and read the story I thought I should give the pie another chance. The title alone was intriguing, The Original ..wow! It's got to be good! So have I got your interest yet? 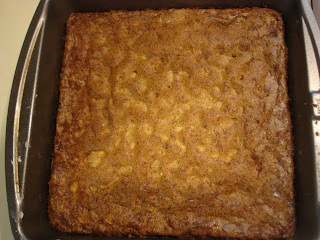 The recipe came from the cookbook I bought recently called " A Baker's Odyssey" by Greg Patent. I just love this book because the author visited kitchens from great bakers all over the country. These bakers represent thirty diverse cultures and he learned the cultural significance of each baked good he saw prepared. This recipe, so the author writes, was from a food historian, Will Weaver, which he got from his grandmother who in turn got it from an old lady in Ephrata, Pennsylvania, who got the recipe at the 1876 Centennial! How about that! See what I mean about the stories? I love it! The pie is not really sweet, which is one of the many things I love about it. As a matter of fact, the only sugar is in the topping. You can eat the pie for breakfast or you can eat it with ice cream ( which we did at the farmer's market today!) or with whipped cream. Or you can just cut a slice, pick it up with your fingers and dive in! But enough about how you can eat it..let's get to making it. I made the dough for the crust ahead and kept it frozen til I made the pie. And... BTW.. the crust has a secret ingredient.. white wine. Oh those Pennsylvania Dutch..who knew! I also made the topping ahead and kept it in the fridge til I was ready. To make the filling, in a small bowl, dissolve the baking soda in warm coffee. Stir in the molasses til the molasses is completely mixed in and the top layer of the liquid is lighter in color and very bubbly( although mine never got very bubbly but it didn't seem to matter). 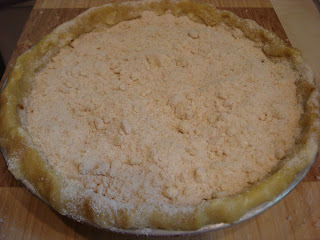 Gradually sprinkle the crumb mixture onto the top of the pie, starting at the outer edge and working towards the center. 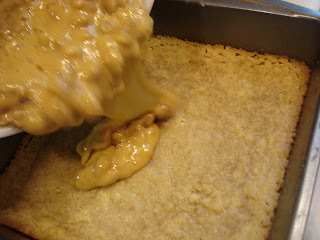 Be sure you sprinkle the outer edge a bit thicker to prevent the filling from bubbling over..and it will! Put the pie into the oven carefully! It will slosh around in the pie shell. Also, (although the book doesn't say) place a cookie sheet or piece of aluminum foil under the pie because if it does spill over, you won't have the problem of what happened to me at first..it spilled and started to smoke in the oven! 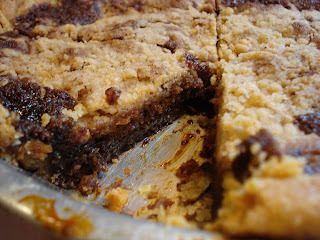 The crust is great, it comes out with a nice crunch, not soggy and the crumb topping adds a wonderful addition to the molasses flavor or the filling. It's a moist pie, too. Someone said it was like a "wet bottom" shoofly pie they remembered. 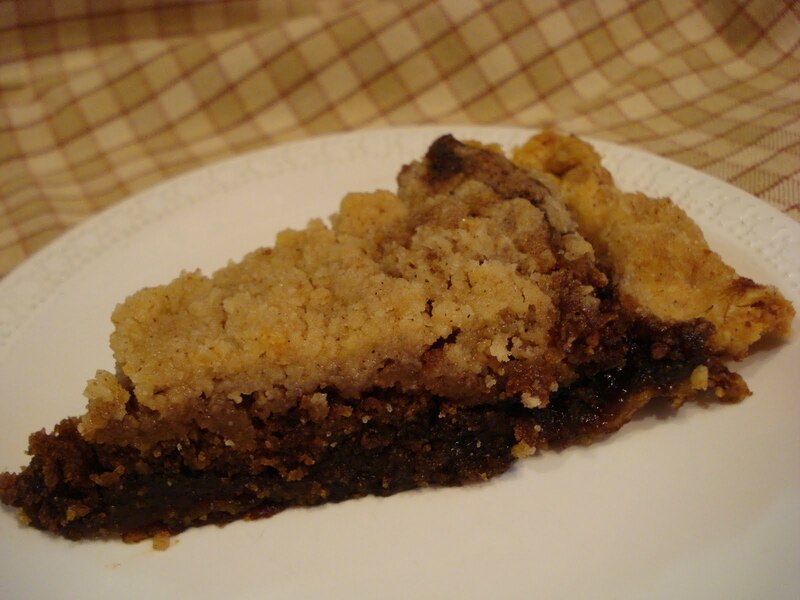 The Original Shoofly Pie ( the book " A Baker's Odyssey" by Greg Patent). 1. In medium bowl, put in the flour and butter and cut, using a pastry blender or 2 knives, til mixture resembles medium fine crumbs. 2. In a small bowl, combine olive oil, egg yolk and 3 tablespoons of wine with a fork. 3. Add the liquid to the flour and stir with a fork til dough just gathers into a ball. If too dry, add more wine, a teaspoon at a time. 5. Unwrap the dough, and place between 2 layers of waxed paper. Tap gently on the dough with the rolling pin to soften the dough slightly and make it easier to roll. Roll, working from the center outward, readjusting the waxed paper and turning the dough over from time to time. Once it's about 1/8" thick, place dough into your pie plate. 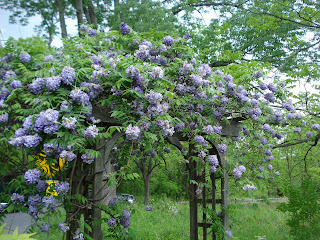 Leave a 1/2" overhang and trim the rest. 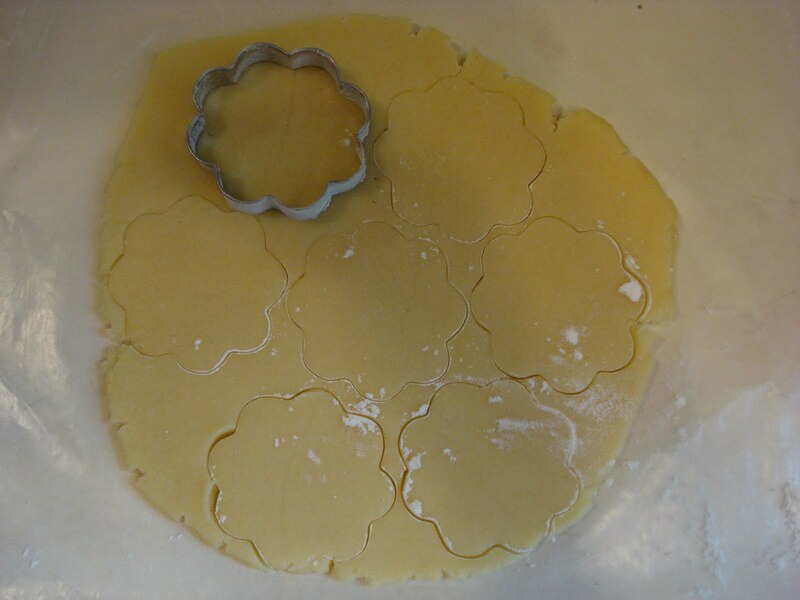 Fold the edge of the pastry back on itself to make double thickness. and make a high standing rim all along the edge, then flute the edge. Refridgerate for 1 hour. 6. Adjust oven rack to lower third position and preheat to 425. 1. Put all the topping ingredients into the work bowl of a food processor fitted with the metal blade and 15 to 30 seconds, til the texture of fine crumbs. 1. 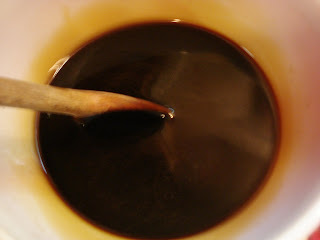 In a small bowl, dissolve baking soda in the warm coffee. 2. 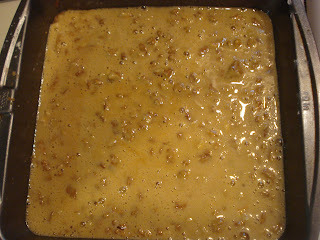 Stir in the molasses and keep stirring for 1 to 2 minutes, til the molasses is completely mixed in and the top layer of the liquid is lighter in color and very bubbly. 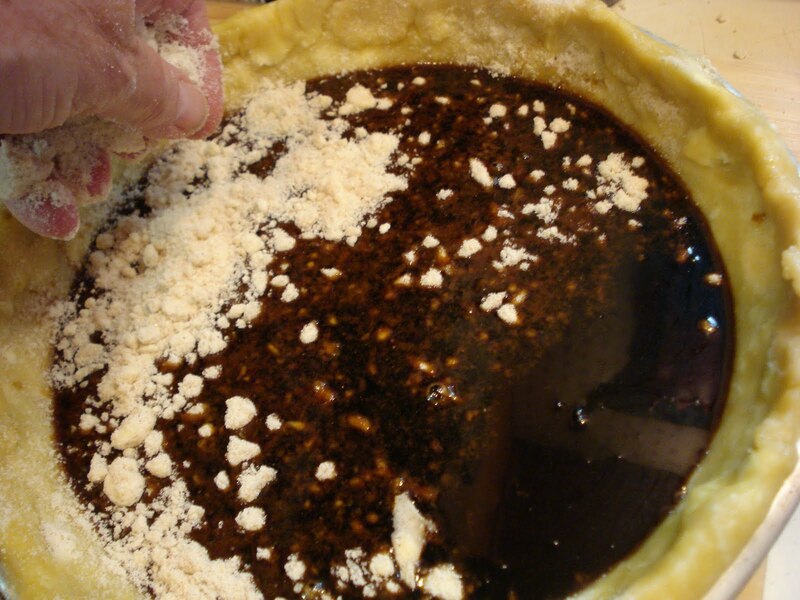 Pour the filling into the unbaked pie shell. Gradually sprinkle on the crumb mixture. Begin at the outer edges and work you way to the center, making the crumb layer a bit thicker around the outer edge to prevent the filling from bubbling over. ( See my notes above). Carefully place the pie into the oven and bake for 15 minutes. Reduce the oven temp. 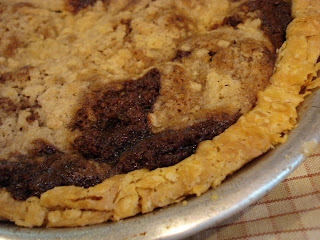 to 350 and bake another 35 to 40 minutes or til the crumb topping is golden brown and the center of the pie is firm and cake-like. 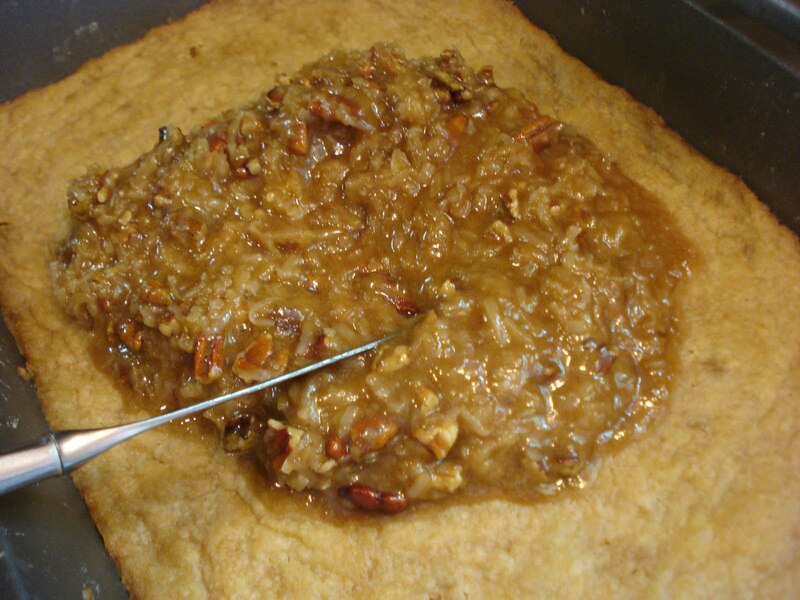 When pressed gently, the top of the pie should spring back and a toothpick inserted will come out clean. Cool the pie on a wire rack and serve warm or at room temp. Enjoy! If you're looking for a quick and easy dessert for this holiday weekend, this one's it. This dream bar recipe I found in one of my many older cookbooks. It really is quick to make and it has a wonderful buttery crust with a coconut and nut topping. It's baked in a 9" x 13" pan and since the bars are kind of rich, you can cut smaller size pieces and get as many as 2 dozen. 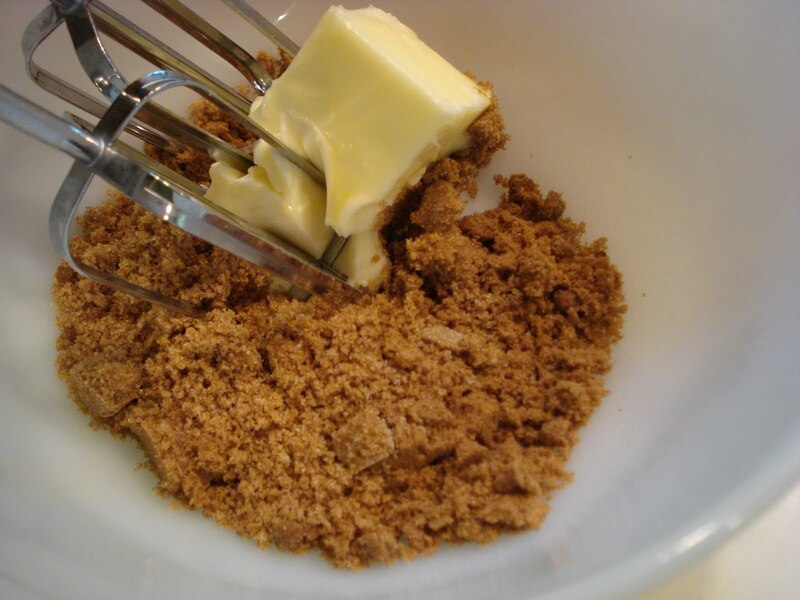 Begin with making the crust by mixing the butter, brown sugar and flour til crumbly. Then press the mixture into your pan and bake it for about 10 minutes. Make the topping by mixing all the ingredients in a medium bowl. Then pour the topping onto the baked crust and bake it another 20 to 25 minutes. Mix the above ingredients til crumbly. Press into a 9" x 13" pan. Bake at 350 for about 10 minutes, until lightly browned. 1. Combine the above ingredients well and pour over the baked crust. 2. Bake again at 350 for 20 to 25 minutes, or until brown. 3. 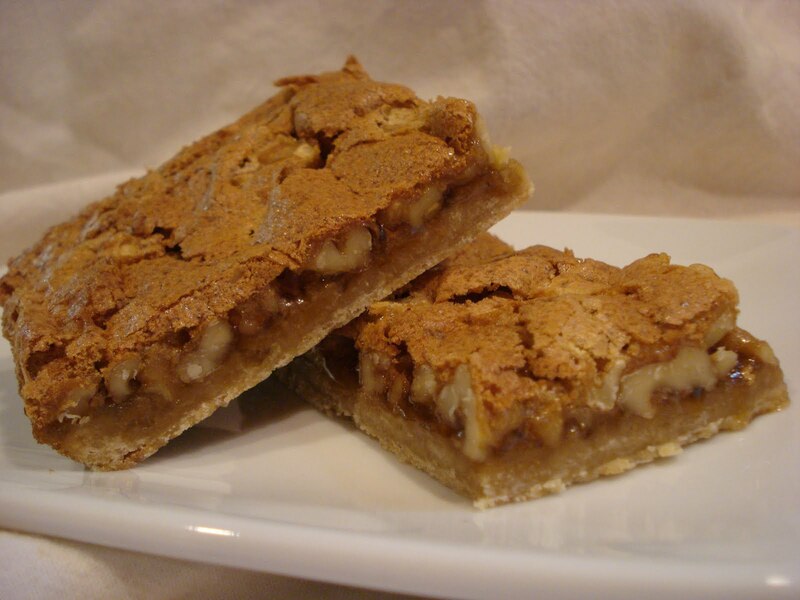 Cut into bars, the size your prefer. 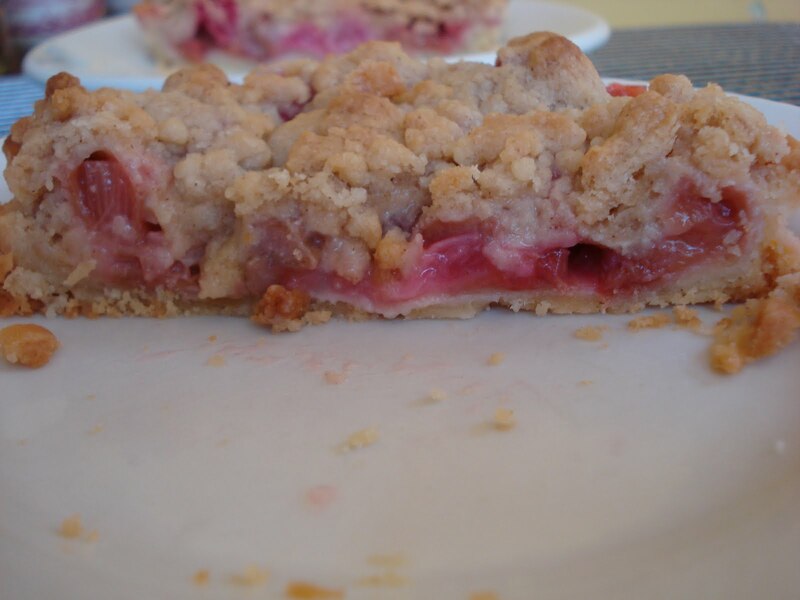 In addition to the crazy obsession I've had this Spring with rhubarb, I can add rhubarb pie to the list. 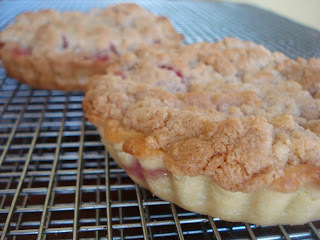 Rhubarb pie crust, to be more specific! 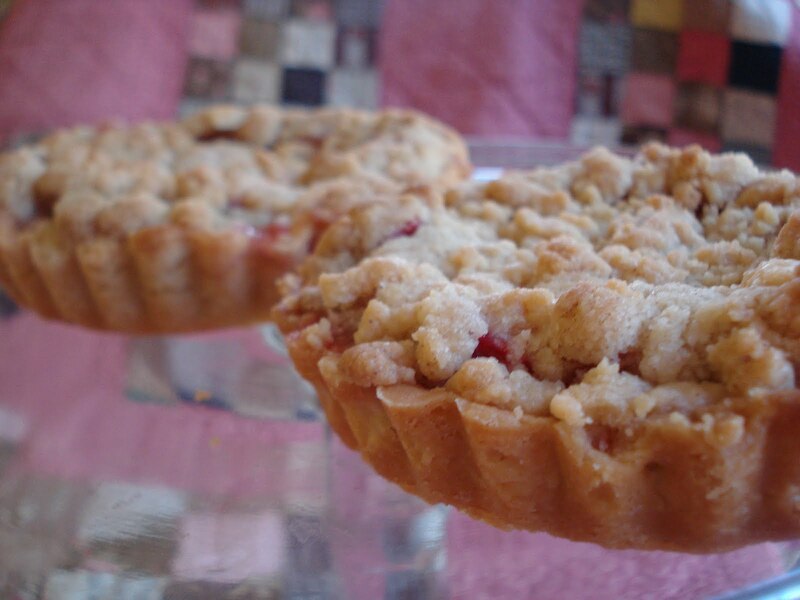 I have been making mini fruit pies and larger strawberry rhubarb pies to sell at the farmer's market but with the larger pies, I can't really see how the crust comes out unless I cut into it, which is exactly what I do. I absolutely hate soggy crust! To me, there's nothing better in a pie than to cut a piece and have the crust still firm with a slight crunch. I have been selling slices, just so I can be sure the crust is fully cooked..crazy , right? I can only imagine what crazy obsession the strawberry and blueberry season will bring me! So I decided to conduct a little experiment this morning. I found a rhubarb pie recipe in my newest cookbook, purchased up at Brimfield. It's called " A Taste from the Past, Good Old Food". Remember, I'm the one who prefers older cookbooks to the ones found at your local Barnes and Noble or Borders today. I didn't use the recipe for the crust from the book but I did use the filling recipe which was just for rhubarb, no strawberry used in it. I made this crust two ways. I had it made, then frozen and then I made another and blind baked it. To each I added the filling, then baked them together for the same length of time and the same temperature. I wasn't confident that the prebaked crust wouldn't somehow burn, having been baked already but it came out great. I should have known I could trust this lady! The sides were a little darker than the one that had been frozen but the results came out that the prebaked crust held up much better to the juicy rhubarb filling without getting soggy! Yeah! You can see from the photo below, the prebaked crust in the back is a little darker along the sides. But still holding up much better. I like to make mini tart pies..is that the correct name for them?! They just cook faster, more of an instant gratification thing, I guess! This pie below is the unbaked crust. Compare the bottom crust to the photo below it, which is the prebaked crust. See how the crust isn't as firm? I'm driving you crazy, too, aren't I? Nice firm bottom crust below. That's what I want to see! 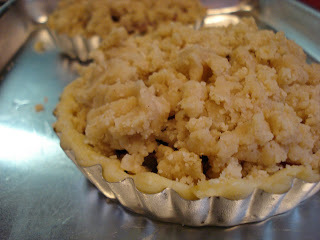 By the way, the crumble topping is the blueberry muffin streusel topping. It works for great for alot more than just blueberry muffins. Although I used the filling recipe from this cookbook, I changed it a little. You'll notice that once you sprinkle sugar onto fruit, it draws out the liquid from the fruit. So what I did was to sprinkle the sugar onto the rhubarb pieces, along with all the other ingredients, then let it sit in the bowl for about 15 to 20 minutes to draw out the liquid. 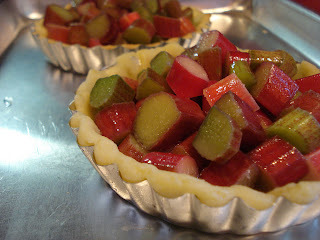 Then I picked up the rhubarb pieces, being careful not to get much liquid that had fallen to the bottom, and placed the pieces into the pie crusts. This way, you avoid extra liquid which = less sogginess..or is that soggyness? 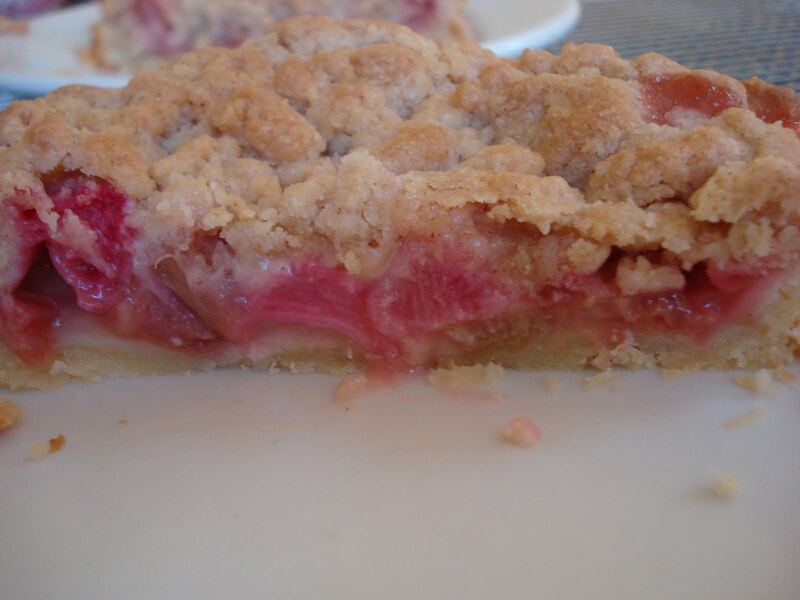 Don't worry, rhubarb has so much extra liquid that it will still come out nice and juicy. So, finally, here's the filling recipe exactly from the book. Just be sure to read all my crazy notes from my experiment, won't you? 1 cup of sugar ( I always use less. Maybe cut down to 3/4 cup. 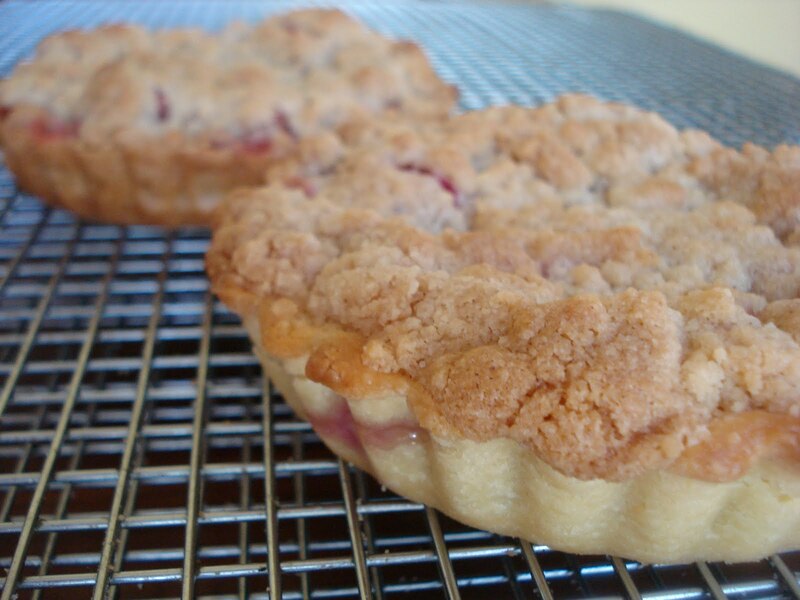 It always seems there's too much sugar in rhubarb pie recipes. What's wrong with a little tartness?). Remove any green leaves from the rhubarb. Cut rhubarb into 1/2" slices. Put into a large bowl. Sprinkle sugar and flour onto rhubarb pieces and stir. Pour in orange juice and stir to combine. Let rhubarb mixture sit to draw out the liquid. Pick up the pieces using your fingers or slotted spoon, leaving some of the liquid in the bowl and place filling into your crust. Proceed with the baking. Let me know who yours turns out! My flea marketing friend, Janet, gave me this older issue of Bon Appetit from August 2006. Now, if you knew Janet, you'd question why in the world she even had this magazine! She never cooks or bakes and even goes out for breakfast! She's never used her oven. But she a generous person just the same! Thanks Janet! So to the cookies. 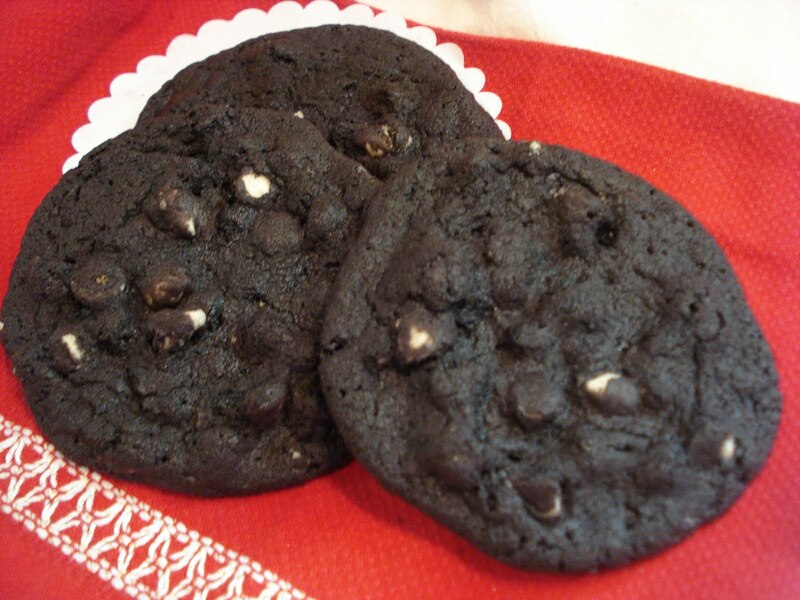 These chocolate cookies sounded really great and they were very chocolatey, probably because I used Valhrona cocoa powder that I'd bought at Whole Foods a while back. And the addition of the brown sugar gave them a nice mellow caramel flavor that you don't always get in a chocolate cookie. I didn't have white chocolate chunks so I used white chocolate chips. I think they'd really be better with the chunks, though. 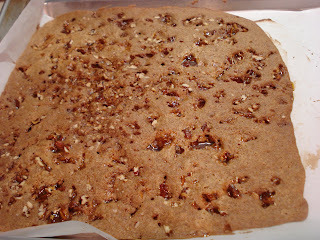 I did omit the pecans but adding them would certainly make the cookie more chunky. They were quite easy to make and I made mine kind of on the large size. Whisk your dry ingredients in a medium bowl. 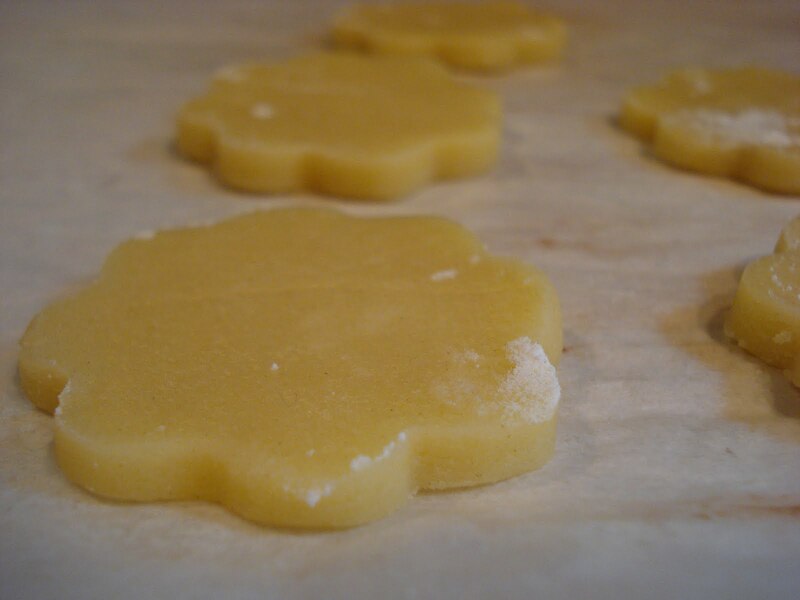 Then beat the sugars, shortening and butter til fluffy. Beat in the eggs and vanilla. 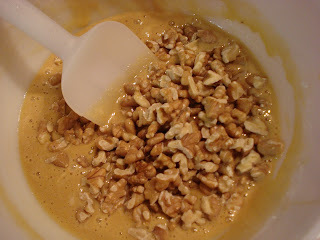 Add the dry, stir and add the white chocolate and nuts. 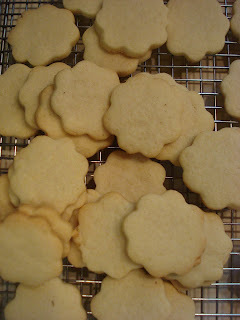 Drop cookies ( I used a cookie scoop) and flatten slightly before baking. 1/2 cup ( 1 stick) unsalted butter, room temp. 1. 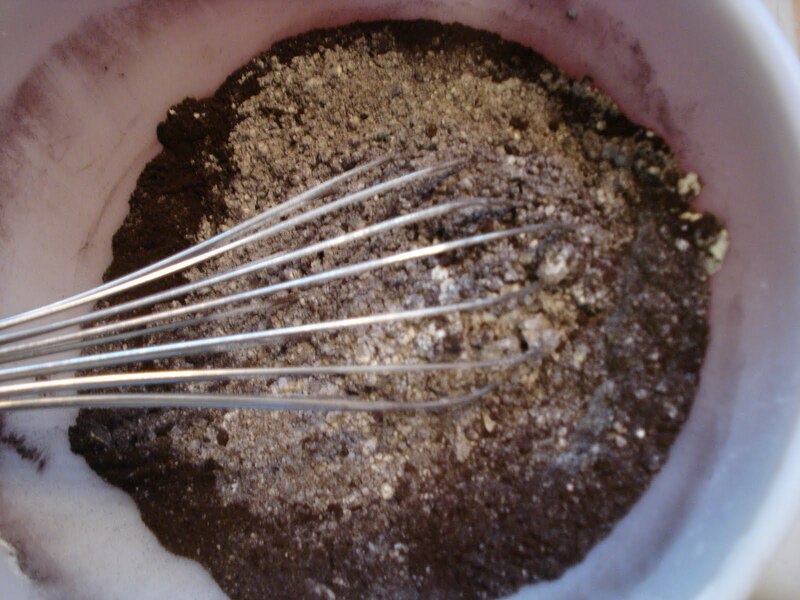 In medium bowl, whisk flour, cocoa powder, baking soda and salt. 2. In mixing bowl, beat sugars, shortening and butter til fluffy. 4. Add dry ingredients and stir to combine. 5. 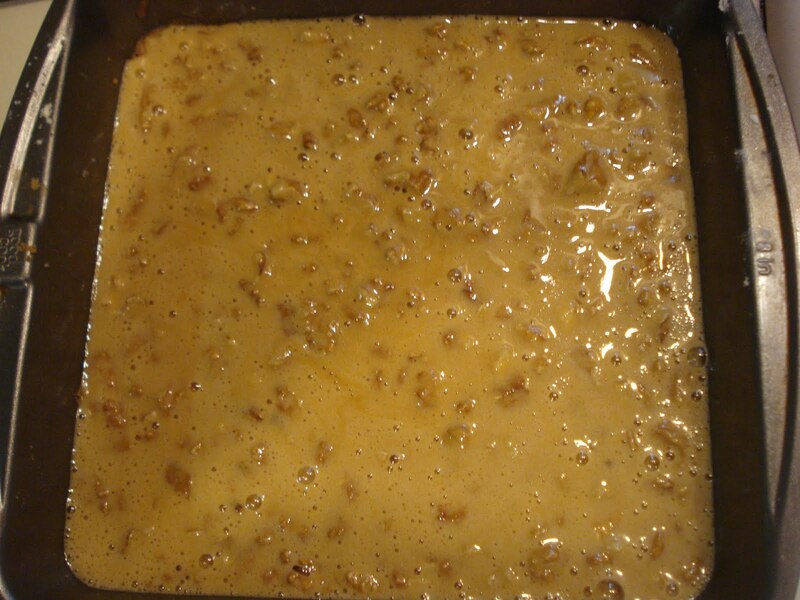 Stir in white chocolate and pecans. 6. Drop dough by tablespoonfuls, spacing 2" apart. Flatten slightly. 7. Bake cookies til just set, about 13 minutes. Whenever I leave the house without my camera, I get that nagging feeling I'm going to see a perfect opportunity to photograph something wonderful and kick myself for not bringing along the camera. I mean, there's so much beauty in this county at every turn, with the old red barns, golden fields, farm animals and stone farmhouses, just to name a few photo worthy views. I think back to the time I was coming home from a Sunday market and were rerouted through a back country road when, seemingly, out of nowhere, a huge group of pigs..yes pigs.. crossed the road right in front of me! Where they came from and where they were going is still a mystery to me! It was such a funny site to see, but, no camera! 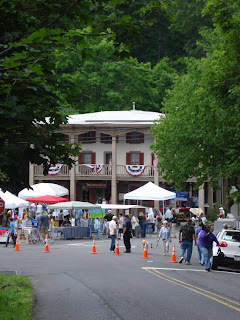 Well, after the farmer's market on Saturday I thought I'd take a ride to Carversville where they were having their annual Carversville Day. And there was a cookie contest going on which I couldn't pass up! Carversville is a delightful and charming historic village and full of the most wonderful old houses. It's a step back in time, a quiet and peaceful area if there ever was one. I strolled through the day's event, heard the announcer ( Noel Barrett..you would know him as the toy expert from the famous Antiques Roadshow on PBS) call the names of the winning cookies, then decided I needed to see more of this beautiful village. 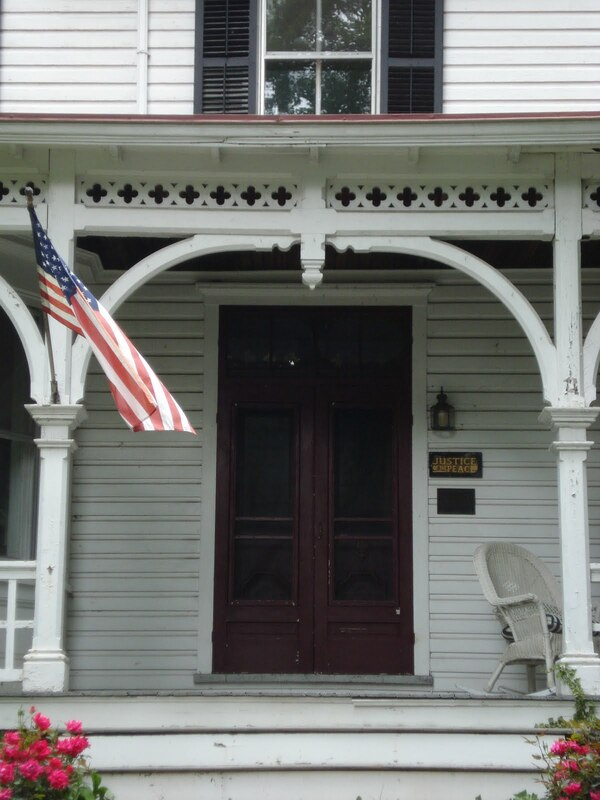 The photos of the houses are along the main street. The house above has a sign that reads " Justice of the Peace". There seem to be quite a few empty looking houses but many are being lovingly restored by people who truly love and appreciate older homes. I loved the American flag in the downstairs window of this house. 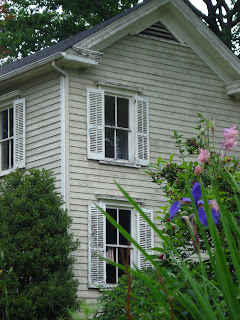 The house has so much character and is one of the homes being worked on. This to me is a typical Bucks County scene with the beautiful gardens and the stucco over stone farmhouse. 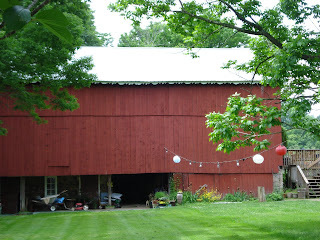 One of the many old red barns that are everwhere. I loved the lanterns strung across the yard, some just hanging bulbs! 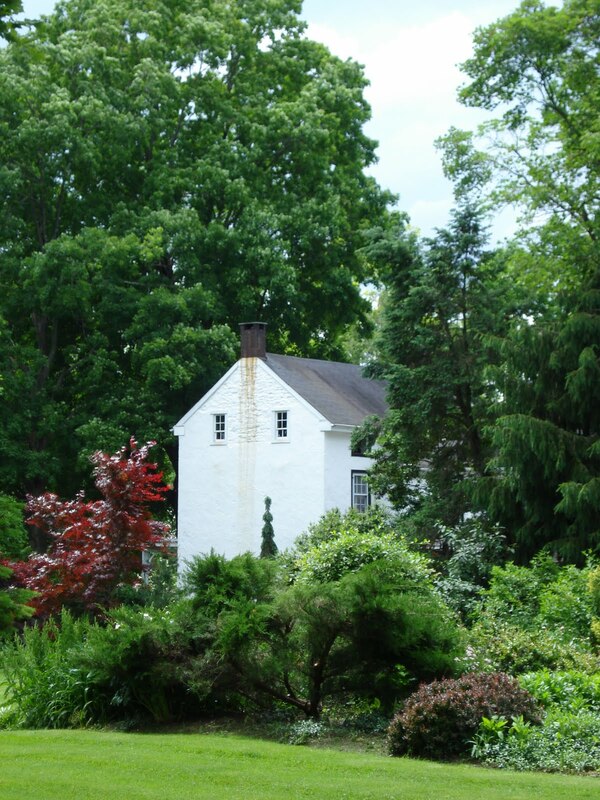 This is the Carversville Inn. 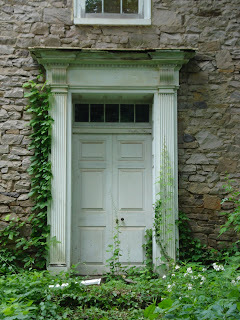 I loved this old stone house. I don't think anyone lives in it as it's really overgrown. 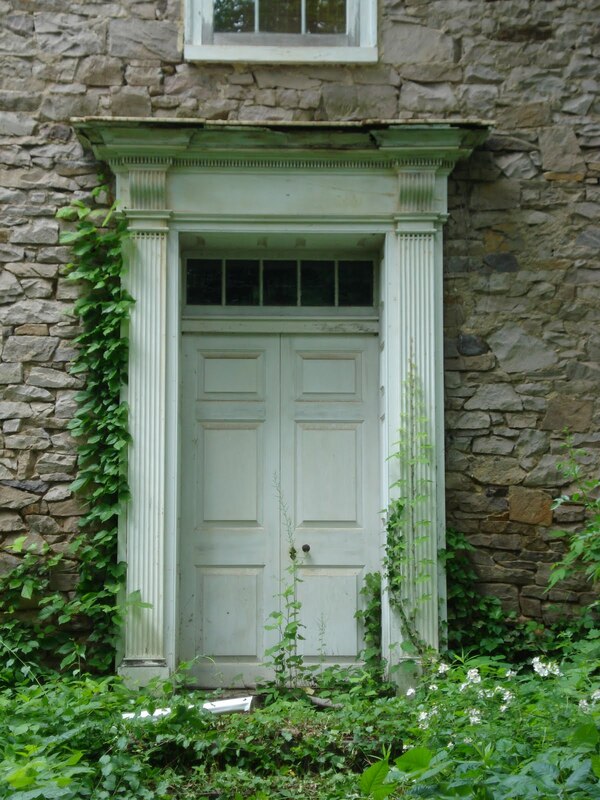 A beautiful front door. Well, I just thought I'd share some of the area where I live. Sometimes, I think about other places to move to that may be more exciting or interesting but there's so much to appreciate right here. What's the expression.. "Bloom where you're planted"! I feel a little guilty tonight because I'm kind of cheating by linking the recipe for these wonderful French cookies to one who is an authority on French baking, for sure! Who better to explain the recipe than Dorie Greenspan. Take a moment to view the video of the late Lionel Poilane making these amazing cookies. He must have been truly a master and it's so heartbreaking to read that his life was cut short. I used the best quality butter I could, which is the same butter I use in my shortbread cookies. When your recipe calls for only a few ingredients, you'd better use the best! I'm sure French butter is very different from ours and Dorie does talk about the different butters and the ones she likes. And, of course, as you can see from the photo, I made them into sandwich cookies, using a raspberry filling I found on Martha Stewart's site ( Once again, linking the recipe!). Making these cookies was very similar to making the shortbread. They go together easily, then you chill the dough, roll them out and chill the dough again. 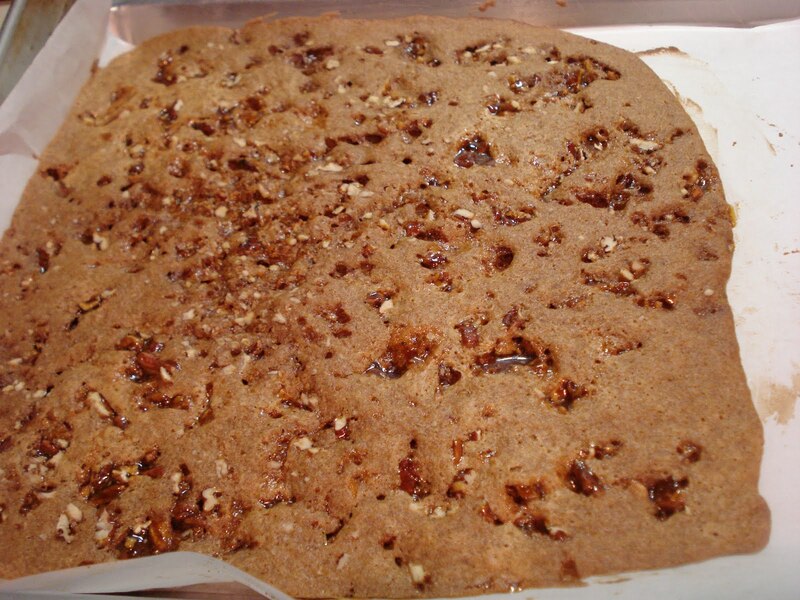 I put them onto parchment paper to bake but you could also try just sprinkling some granulated sugar onto the baking sheet without the parchment. I think because of all the butter,it shouldn't stick. Just remember to take your metal spatula and loosen them just after they come out of the oven because if they cool too long on the sheet they may be very difficult to remove in one piece. I wound up really loving the thinner ones, the ones that were rolled out to 1/8" thickness. They were crunchier and I love the crunch! Dorie said to bake til still pale but I like them baked til they have a slight light brown color on the edges. Now, maybe that's not the correct French way to do it but, it's just my preference. 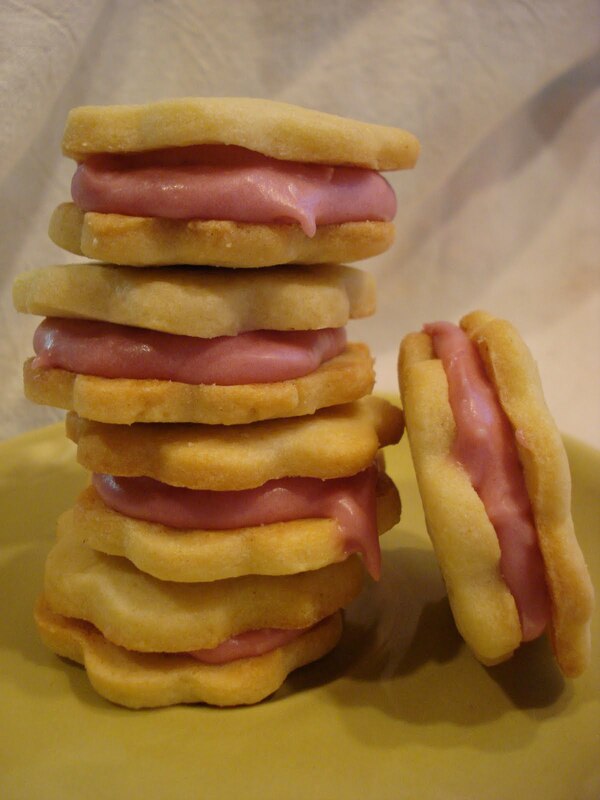 Other fillings, if you chose to make sandwich cookies, could be chocolate ganache, the mint or coffee filling Martha has recipes for, or how about a nice citrus filling like lemon or orange? So go ahead and try them. 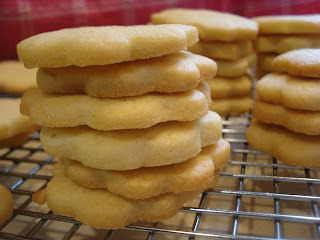 They are a wonderful lightly sweet little cookie. 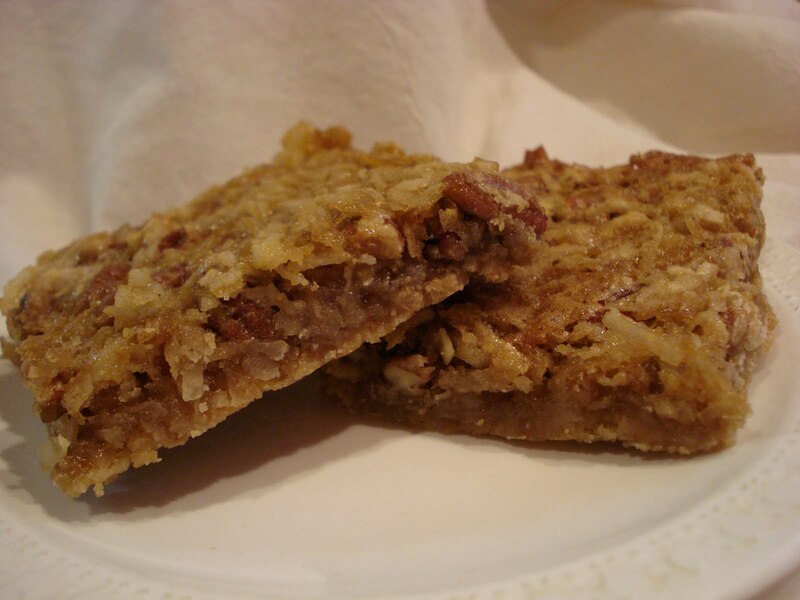 This recipe was originally called Black Walnut Bars, but as I was fresh out of black walnuts, I could only use what I had on hand, which was regular walnuts. But, hey, if you have black walnuts in your pantry, go ahead and use them! The cookbook I found these bars in is one of the books I found at my local flea market called "Great Home Cooking in America". It's by the Food Editors of Farm Journal so you know these recipes are good old down home country baking recipes! I seem to gravitate towards the more old fashioned cookbooks of this kind, rather than the newest and pricier books that are recently out at the bookstores. Must be the country girl in me! Ha! 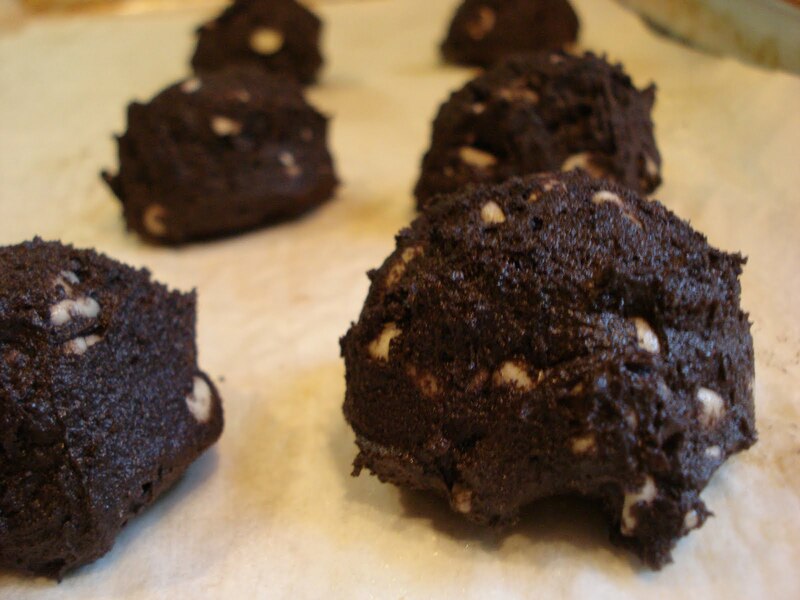 Getting back to the recipe, according to the book, black walnuts are popular in baking in Pennsylvania Dutch Country, which is only about an hour from here. But this recipe is actually from Iowa. I've made a few changes to the original recipe. I made these bars twice. The first time I thought the crust had way too much butter so the second time I almost cut the amount of butter in half and it was much better. I also never use margarine and the recipe called for either butter or margarine so I chose, of course, butter. The bars remind me of a pecan pie, with the filling kind of gooey in the center and the crunch of the nuts on top. And you could certainly swap out walnuts and use pecans, if you don't like walnuts. 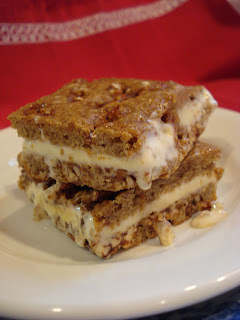 It's really really a delicious dessert bar, just remember to let it cool for a few hours before cutting into squares. 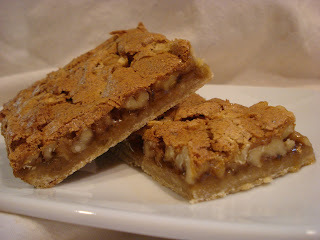 Because the bars are a bit on the rich side, you may want to cut them into small squares, like 2" x 2", although the recipe says to cut them 2" x 1". Start with the crust by mixing the flour and brown sugar together in a large bowl, then cut in the butter (I used my fingers) . Press crust into your pan and bake 10 minutes. Take it out of the oven and let it cool 10 minutes. Beat the eggs til light, then gradually beat in the brown sugar and vanilla. Stir together the flour, baking powder and salt and add to the egg mixture along with the nuts. Place back in the oven at 375 for about 20 minutes, or til nice and brown on top. The center sets better if you let it bake til the top is a nice darker ( but not burnt!) color. 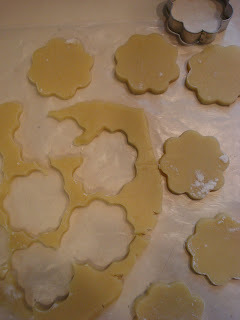 Just be sure to let it cool in the pan for a few hours before you cut into squares, so the center sets better. Preheat oven to 350. Grease or butter a 15 1/2" x 10 1/2" x 1" jelly roll pan. ( I halved the recipe and used an 8" x 8" pan. 1. Mix together the 2 cups of flour and 1 cup of brown sugar in a large bowl. 2. Add the butter and mix with your fingers til crumbs form. 3. Press mixture into your prepared pan and bake 10 minutes. 4. Take crust out of the oven and let it cool about 10 minutes. 5. Turn oven up to 375. 1. Beat eggs til light. 2. Gradually beat in the 2 cups brown sugar, then the vanilla. 3. In a small bowl, stir together the 2 tbsp. of flour, baking powder and salt. 4. Add this to the egg mixture along with the nuts. 5. 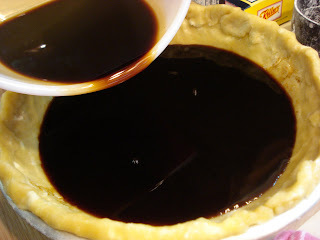 Pour onto the crust and bake about 20 minutes, or til the top is a nice darker ( but not too dark browned) color. 6. Cool bars in pan for a few hours so the filling sets well. Cut into sizes you like. New life for your old mixer..a mini herb garden!